Morbihan (French pronunciation: ​; Breton: Mor-Bihan, IPA: ) is a department in Brittany, situated in the northwest of France. It is named after the Morbihan (small sea in Breton), the enclosed sea that is the principal feature of the coastline. It is famous for the Carnac stones, which predate and are more extensive than the more familiar Stonehenge. 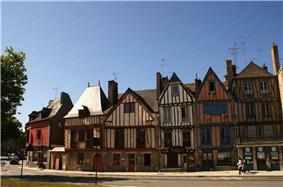 Morbihan is one of the original 83 departments created during the French Revolution on March 4, 1790. 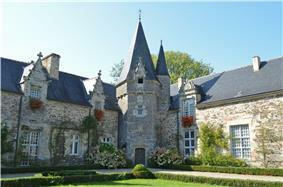 It was created from a part of the Duchy of Brittany. It is the only French department whose name comes from the Breton language. Morbihan is part of the current region of Brittany and is surrounded by the departments of Finistère, Côtes-d'Armor, Ille-et-Vilaine, and Loire-Atlantique, and the Atlantic Ocean on the southwest. The Gulf of Morbihan has many islands: 365 according to legend, but, in reality, between 30 and 40, depending on how they are counted. There are also many islets which are too small to be built on. Of these islands, all but two are private: l'Île-aux-Moines and l'Île-d'Arz. The others are privately owned, some by movie stars or fashion designers. Meaban, just outside the Port du Crouesty is an ornithological reserve and it is forbidden to alight there. The Breton language is an important issue, with many advocating bilingual education. The Carnac stones, megalithic alignments of Carnac are situated in Morbihan.